I have a hard time doing straight traditional food on a holiday. I feel compelled to bend it just a little. This may be one reason why The Hub and I have never been tapped to host the family Passover seder – the fear that I’ll sneak chipotles into the matzo balls, or some such thing. Potato salad seems to be the sought-after side for Fourth of July picnics. If you’re like me, and prefer to show some independence on Independence Day, you can go beyond the old ‘taters and mayo. The color of this salad made the tasters who sampled the recipe for my cookbook “Potato Salad: 65 Recipes from Classic to Cool” (Wiley, 2009) blink a few times. But those founding fathers liked to have some fun, and I think they’d get it. Place the potatoes in a large pot, add enough water to cover them, cover the pot with a lid and bring to a boil. Cook until the potatoes are pierced easily with the tip of a sharp knife, 10 to 12 minutes. Drain and let cool until you can handle them. Cut them into quarters or halves, depending on the size of the potatoes. In a large bowl, combine the blue cheese, chives, walnuts, sour cream, mayonnaise, salt, pepper, celery and onion. Add the potatoes and toss to combine. Cover and refrigerate for several hours to overnight. Market Restaurant’s got hives, but the buzz is that they’re a good idea. The News & Observer (Raleigh, N.C.) writes that the Raleigh restaurant has started a CSApiary with beehives on its roof. Read more here. The Charlotte (N.C.) Observer travels around the world in four potato salads here, because they’re more American than apple pie for Fourth of July picnics. Taiwanese apple and ham…mmm. From brick-and-mortar restaurants to metal-and-rubber food trucks to – pedal-and-foot bikes? Food delivery by bicycle is the next thing, says the Independent Weekly (Durham, N.C.) here. 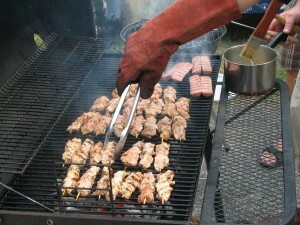 Make slow-cooked barbecued pork without getting the vapors outdoors in the heat, says the Charleston Post and Courier. Find the recipe here. OK, if you insist on being stereotypical for the Fourth, the Winston-Salem (N.C.) Journal has recipes for palm-sized versions of apple pies that you can eat while wandering your picnic. Read more here. Just watch out for Yogi Bear. Pop a cold one and have a good read about libations. The Kansas City Star has a review of new books on the topic here. I love bacon – who doesn’t, except The Hub’s vegetarian co-worker. And I have embraced the juggernaut that is bacon-everything. Bacon peanut brittle, sublime. Bacon crunchies on ice cream, divine. But apparently there is a limit. A friend sent me this link to reviews on Amazon for a brand of bacon-flavored jelly beans. Among the comments: “Sweet Jesus, why didn’t I read the reviews?” and “If bacon tasted like these, I’d be a vegan.” The review that begins “Putridness that lingers” goes on to compare the flavor to that of a dead possum soaked in wolf urine. Makes me wonder what that reviewer’s usual diet is. On the upside, a lot of people liked the tin they came in. Three chefs agreed on only one thing about cooking steaks in an article in The News & Observer (Raleigh, N.C.). Find out what that was here as they discuss beefy things in honor of Father’s Day, which is this Sunday. Father’s Day seems to bring out the Fred Flintstone in food publications. The article is in the Charlotte (N.C.) Observer, too. There, Kathleen Purvis reveals her hatred of summer – finally, someone had the guts to do it. It’s here. I make jams and jellies because they taste better, and my friends and I have a good time in the kitchen doing it. GreenEats looks at DIY food from a self-sufficiency point of view, with reviews of books on the matter. A plethora of ideas for summer entertaining can be found in Savor NC magazine, and they all look good. Ideas for using blueberries, too. Read more here. A light and easy summer version of chicken pot pie is in the Charleston Post and Courier. Watch the how-to video here. Atlanta Journal-Constitution columnist John Kessler takes a road trip to Alabama. Find out what he ate on the way here. JanNorris writes about an interesting event that’s going to happen in Palm Beach, Fla. The Palm Beach County Food Swap is designed for home cooks to swap goods. Read more here. Yes, when I think of sludge, burritos often spring to mind. 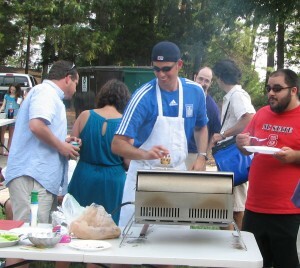 My husband’s coworker, John, had told us tales of the Grilling and Chilling event at Holy Trinity Greek Orthodox Church in Raleigh, N.C. for years. Always after the fact, leaving us to merely imagine the sizzling goodness. This year, John produced “press passes” that served as our invitations. All we had to do was follow the cloud of smoke. Food is a big deal at the church. I have to say, the potlucks I went to at the neighborhood Presbyterian church as a kid were nothing like this. For starters, there was nothing suspended in Jell-O. The event, held for the third year, started out of a desire to have more church events that were just fun, says member Mark Langford. The post on Twitter asked for information on “unheralded, unknown beer joints.” And it brought back to me the most unheralded, (but not unknown in its town) beer joint I’ve ever visited. It was the kind of borderline unsavory place that inspires scenes in novels and epic excuses to spouses. Pretty good for a place with little seating. Al’s Night Hawk was located on the main drag through Salisbury, N.C., a bit off the street. The building, when I knew it in the early 1980s, had been built to be a drive-in burger joint in the ’50s. And it still served hot dogs, which I was advised by natives to avoid. Food was not the draw. You pulled in at most any hour, got a beer, and sat in your car and drank it. I was assured that its reputation was better than its appearance. I was a reporter at the Salisbury Post, which was an evening paper then. That meant we went in early, and the deadline for copy was around noon. One winter day, a giant snowstorm threatened. The publisher moved up the deadlines so that carriers could get the paper delivered before the blizzard. He told the reporters and editors to put out a small edition, then go to our homes to hunker down. When we were done, a few little flakes were falling. We had a free afternoon off. We weren’t about to go home. Two other reporters and I got in the managing editor’s car. The small town had locked up tight in fear of the white blast, but he knew one place would be open. We crept down the whitening street and saw the friendly lights of Al’s Night Hawk. We were the only car in the lot, but that didn’t matter. The ME went in to buy the first round. After the fourth trip inside, the Al’s folks did suggest that they might be wanting to close, and the snow was starting to pile up on the hood. We admitted it was probably time to hunker. Al’s is gone now. I don’t remember now what we talked about or what we drank, although I’m sure it was something cheap in a can. But I remember the feeling of being let loose from school on a snow day, with people I not only worked with but enjoyed being with. Even in a car in a seedy parking lot.